I-4 Ultimate is made possible through an innovative public-private partnership (P3). When complete, the Express Lanes will provide new options on I-4 and help get you where you need to go. We are committed to the traveling public and the community and to delivering a dependable option for drivers. Explore this section of the site to learn more about the planned Express Lanes and how Express Lanes are keeping traffic moving in other parts of the country. To provide more reliable travel times for Central Florida drivers and manage traffic efficiently, two dynamic tolled Express Lanes will be added in each direction of I-4. Pricing will go up or down depending on the number of vehicles using the Express Lanes. The tolls will be collected electronically, with automated signs notifying motorists of the cost, which drivers will lock in when entering the Express Lanes. The Express Lanes will be separated by a concrete barrier and are designed to keep traffic moving at 50 mph. Monumental pylons will be placed at each entry and exit point, adding a unique aesthetic feature to I-4. Direct-access ramps will link the 4 Express Lanes with State Road 408 for a smooth transition. So when time is more valuable than paying tolls, Express Lanes will serve as a convenient solution. Miami-Dade County successfully converted high-occupancy vehicle lanes on I-95 to Express Lanes, and the improved speeds are keeping traffic moving. Managed lanes, or Express Lanes, are becoming increasingly attractive options for managing congestion, adding capacity to limited-access roads and providing choices to drivers. Managed lanes projects are successfully operating in Florida on I-595 and I-95, California on State Road 91 and I-15, Colorado on I-25, Georgia on I-85, Minnesota on I-394, Texas on I-10, Utah on I-15 and Virginia on I-495. 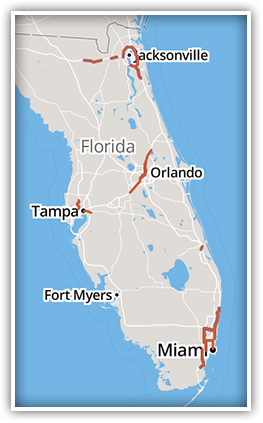 Additional projects either in design, construction or under development include I-75 and State Road 826 in Florida, State Road 91 — an extension of the existing Express Lanes — in California, U.S. 36 in Colorado, I-635 and State Road 820 in Texas and I-95 in Virginia. The Florida Department of Transportation (FDOT) is building on the success of these facilities and bringing Express Lanes to Central Florida as part of the I-4 Ultimate project. 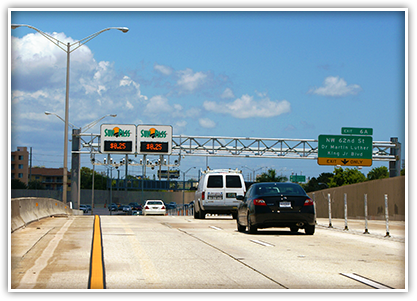 Keep reading to find out more about how Express Lanes are operating throughout the country and right here in Florida. The 595 Express Lanes project consisted of the reconstruction, widening and resurfacing of the I-595 mainline and all associated improvements to frontage roads and ramps. A total length of 10.5 miles, the project extends from the I-75/Sawgrass Expressway interchange to the I-595/I-95 interchange. Three reversible express toll lanes, which are separated from the general use lanes by a concrete barrier, were built along the median and are operated as managed lanes with dynamic tolls. The goal is to optimize traffic flow. The lanes reverse direction during peak travel times, carrying traffic eastbound to major employment centers in the morning and westbound in the evening. Tolls are currently set at a minimum of $0.50 and a maximum of $2. The 595 Express Bus service was also introduced as part of this project and operates during peak hours Monday through Friday. The $1.2 billion project was implemented as a public-private partnership (P3) and awarded to a concessionaire to design, build, finance, operate and maintain the managed lanes for 35 years. The P3 approach allowed the project to be completed at least 10 years sooner than if the Express Lanes had been built in sections as originally planned by FDOT. At its peak, the project had approximately 2,500 workers on site, representing 160 firms. 595 Express opened to the public on March 26, 2014. The state of Florida is planning and operating a number of Express Lanes to help drivers bypass congestion and improve traffic flow. 95 Express is providing commuters in Miami-Dade County with new choices by creating more travel options and encouraging the use of ridesharing and transit alternatives. Being implemented in two phases, the 95 Express project includes converting the existing high-occupancy vehicle (HOV) lanes to Express Lanes, adding a new lane in each direction and implementing congestion pricing and ridesharing incentives. Enhanced bus rapid transit (BRT) systems, travel demand incentives and dynamic tolling are also reducing congestion and offering a more reliable trip. Drivers are now experiencing improved speeds above 40 mph in the general use lanes and 50 mph in the Express Lanes. Prior to 95 Express, all lanes were operating below 20 mph during rush hour. The first phase of 95 Express, which runs northbound from north of I-395/State Road 936 to the Golden Glades area north of NW 151st Street and southbound from south of Miami Gardens Drive/NW 186th Street to north of I-395/State Road 836, began collecting tolls on January 15, 2010. The second phase, extending the Express Lanes from the Golden Glades Interchange in Miami-Dade County to Broward Boulevard in Broward County, is scheduled for completion in spring 2015. The Express Lanes are separated from the general use lanes by a barrier of flexible plastic poles, and tolls are currently set at a minimum of $0.50 and a maximum of $10.50. The first toll road to use dynamic pricing in the country, the 91 Express Lanes, is touted as a time-saving alternative for drivers traveling between Orange and Riverside counties. Drivers can save an average of 30 minutes when commuting from the residential areas in Riverside and San Bernardino counties to major employment centers in Orange and Los Angeles counties. The 91 Express Lanes feature four lanes covering 10 miles and were built in the median of the Riverside Freeway (State Road 91) between the Orange/Riverside County line and the Costa Mesa Freeway (State Road 55). In addition to being the first dynamic tolled road in the United States, the 91 Express Lanes were the first fully automated toll road to use electronic transponders for toll collection. The 91 Express Lanes were opened to traffic on Dec. 27, 1995, at a cost of $135 million. Financed, owned and operated by a private developer, the facility has seen financial and traffic management success with 40,000 trips per day and $25 million in annual toll revenue. The award-winning, first-of-its-kind project has been toured by transportation officials from 26 countries and 23 states and continues to serve as a model for managed lanes technology, toll operations and customer service. Born out of a need to maximize capacity and relieve congestion on the heavily traveled I-15 corridor from State Road 163 in San Diego to State Road 78 in Escondido, the I-15 Express Lanes are viewed as the most innovative highway in San Diego County. The I-15 Express Lanes corridor was built in three segments, and the entire system of managed lanes was fully operational in January 2012. Stretching 20 miles and four lanes, the facility reduces commute times, incentivizes public transit and encourages ridesharing. Vanpools, carpools, buses, motorcycles and HOVs can use the Express Lanes for free, helping to relieve congestion in the general purpose lanes. An additional feature launched in June 2014 is rapid bus service, which connects communities along I-15 to employment and leisure destinations, as well as other transit modes. The I-15 Express Lanes corridor was funded in part by a half-cent sales tax, TransNet, which was approved by San Diego County voters in 2004. An innovative feature of this $1.4 billion project is the moveable median barrier that allows up to three Express Lanes to be open on the 16-mile stretch between State Road 163 and the Via Rancho Parkway. This flexibility helps traffic flow during peak hours and counters delays caused by accidents or emergencies. Only the fifth managed lanes project in the United States to use pricing as a congestion management tool, I-25 aims to increase usage of the HOV lanes without decreasing the level of service. Rush hour traffic totals more than 22,400 passengers on the seven-mile facility between downtown Denver and U.S. 36, including 260 buses, 4,700 HOVs and 4,000 vehicles paying a toll. The Express Lanes are reversible, with vehicles traveling southbound in the morning and northbound in the evening. Drivers choosing to use the HOV lanes are separated from the general use lanes by a concrete barrier. Buses and HOVs do not have to pay a toll, but single-occupancy vehicles (SOVs) entering the lanes can expect to pay a toll ranging from $4 to $6 during peak travel times. The I-25 Express Lanes, also known as the Downtown Express Lanes, opened to traffic on June 2, 2006. All tolls are collected electronically, and license plate tolling was introduced in January 2009 as another method of toll collection. At a cost of approximately $10 million, the project generates $5.4 million in revenue each year and benefits residents and commuters through shorter commute times, improved air quality and increased capacity on the I-25 corridor. The I-85 Express Lanes in the northeast Atlanta metropolitan area extend from Chamblee Tucker Road, just south of I-285, to Old Peachtree Road in Gwinnett County — a distance of approximately 16 miles. Qualified carpools and transit can use the Express Lanes toll free, while other vehicles are subject to a toll ranging from $0.01 to $0.90 per mile. Vehicles with two or more axles and/or six or more wheels cannot enter the Express Lanes. I-85 uses dynamic pricing, which continuously adjusts the toll to keep traffic flowing at an average speed of 45 mph 90 percent of the time. All-electronic tolling also allows traffic in the Express Lanes to flow freely. Goals for the $182 million project, which converted HOV lanes to Express Lanes, include more reliable travel times, commuter choices and regional transit enhancements. Usage of the I-85 Express Lanes has tripled since their opening in October 2011. Commuters — whether using cars, vanpools, buses or transit — have benefited from shorter and more reliable trip times. In addition, transit has realized significant benefits, including new and expanded park-and-rides, new passenger coach buses and expanded express bus services. The I-394 MnPASS Express Lanes remove an average of 3,000 cars from the general use lanes each day. This effectively achieves the goals of maximizing capacity through the corridor and making better use of the capacity in the converted HOV lanes. Completed in May 2005, the 11-mile I-394 MnPASS Express Lanes project was the first of its kind in the state of Minnesota — a P3 that received funding from a private firm. The project successfully converted the existing HOV lanes to Express Lanes on I-394 between the western suburbs and downtown Minneapolis. Speeds and capacity are maintained through dynamic pricing, which changes the amount of the toll based on the level of congestion in the Express Lanes. Currently, the tolls range from $0.25 to $8; however, carpoolers, buses and motorcycles can access the lanes toll free. The I-394 Express Lanes are separated from the general use lanes by double white lines. The overall purpose of the Express Lanes is to get people to their destinations faster. Additional benefits seen since implementation include a fast and reliable option for drivers and improved operating efficiency in the corridor. In the first year of operation, the number of tolled trips increased from 10,000 to 20,000 per week, and more than 95 percent of Express Lanes users approve, with approximately 60 percent of the Twin Cities residents saying that giving drivers an option to pay for a more reliable travel time was a good idea. With a population expected to grow by 2 million in the next four years, the city of Houston needed a solution to provide its residents with more reliable travel times. The Katy Managed Lanes effectively combines HOV lanes, mass transit and toll roads to provide more options for all commuters. Running between State Highway 6 and Interstate Highway 10, the I-10 Express Lanes extend a total of 12 miles through Houston and are separated from the general use lanes by flexible barriers. The project, which included replacing the existing single, reversible HOV lane with two managed lanes in each direction, was completed in 2009. Buses and carpoolers have benefited from more predictable trips, and SOVs choosing to use the lanes — available to them 24 hours a day — have also realized time savings. The lanes remain free to buses, carpoolers and motorcycles during HOV hours (Monday through Friday, 5 to 11 a.m. and 2 to 8 p.m.). However, all drivers must pay a toll at all other times. Tolls follow a schedule that reflects traffic volumes and can range from $0.30 on the weekend to between $1 and $3.20 during peak hours. In addition, vehicles with three or more axles are subject to a $7 toll at each tolling plaza. All tolls are collected electronically, contributing to the free flow of traffic. Utah is home to the longest continuous stretch of carpool lanes in the United States. The I-15 Express Lanes span I-15 from U.S. 6 in Spanish Fork to 2300 North in Salt Lake City and from Parrish Lane in Centerville to Layton Parkway — a total of 62 miles. Originally an HOV lane, this project converted the existing lane into two high-occupancy toll (or Express) lanes, with one running in each direction. Priority is given to carpoolers, buses, clean fuel vehicles and motorcycles, all of which can use the lanes without charge, while SOVs are subject to a toll when using the Express Lanes. Cars without transponders, trailers and trucks more than 12,000 pounds are prohibited from entering the lanes. The I-15 Express Lanes are divided into six payment zones, and toll rates within each zone, which are calculated every five minutes, range from $0.25 to $1 based on the level of congestion in the Express Lanes. Dynamic pricing has provided an efficient means to better manage traffic and congestion, ensure reliable travel times, improve overall facility performance and provide commuters with additional options. Opened on August 23, 2010, the I-15 Express Lanes maintain speeds of approximately 55 mph and are keeping traffic moving in Utah. On the 495 Express Lanes, drivers can travel an average of 65 mph — even during rush hour. Drivers have been overwhelmingly supportive of the lanes, which opened in November 2012, and have noted significant benefits: 90 percent have noticed fewer slow-downs, 85 percent enjoy the ability to maneuver around surface-road traffic, 84 percent report predictable travel times and 83 percent appreciate the dedicated safety crew. Additional project benefits include enhancements to the 45-year-old infrastructure, replacement of more than 50 bridges and overpasses, upgrades to 10 interchanges and improvements to new bike and pedestrian access. The 495 Express Lanes are high-occupancy toll lanes on the I-495/Capital Beltway. Four lanes — two in each direction — carry traffic from the Springfield interchange to just north of the Dulles Toll Road — a total length of 14 miles. With dynamic pricing used to manage congestion, drivers can expect to pay as little as $0.20 to $1.25 per mile. Buses, carpools, motorcycles and emergency vehicles can use the lanes without paying a toll, while trucks are prohibited from entering the Express Lanes. At a cost of $1.2 billion, the 495 Express Lanes were completed as a P3 to take advantage of the best technology, financing, engineering and innovation available. Curious about the purpose of and need for Express Lanes on I-4? Browse through the Traffic and Revenue Reports to learn more about what’s shaping the pricing policy. The Traffic and Revenue Support Data provides in-depth information on future corridor, general use lane and managed lanes traffic forecasts, while the Draft I-4 Ultimate Traffic & Revenue Summary and the Technical Memorandum review the methodology and results of the study.